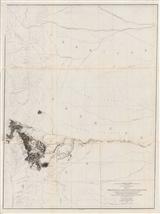 Description: State map with insets of Pike's Peak and Mount of Holy Cross. Chromolithograph. Description: Geographical map of the Telluride Quadrangle in Colorado with colour-coded reference panel. Printed colour. Description: Colorado Springs and Colorado City. An early tourist map in bright printed colour showing places of interest and how to get there. Description: Denver city plan. Original printed colour. Description: Colorado Springs. Detailed topographical map centring on Pike's Peak, detailing settlements between Cripple Creek and Colorado Springs. Printed colour. 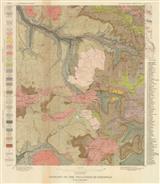 Description: Colorado Plateau and environs. Detailed plan. Original printed colour. 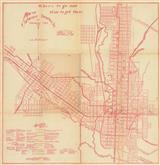 Description: Vintage street plan of Denver and its suburbs with inset maps of the central business district and of Englewood. Streetcar lines and bus routes are marked. Printed colour. 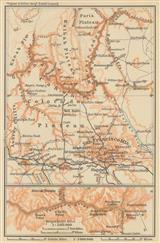 Description: Vintage map of Colorado showing mineral deposits, as well as promoting unexplored areas "where conditions are particularly favorable for prospecting". Printed colour. Description: Vintage street map of Colorado Springs and surrounding suburbs. Inset maps of Security and Cragmor, two new suburbs under construction at the time of publication.